All permits for construction at 425 Park Avenue have been approved, and work may begin shortly; the existing building is being partially demolished to make way for 42 stories of offices, designed by Norman Foster. The developer is L&L Holding Company. The entirety of the redevelopment will encompass approximately 513,000 square feet, and the height to the highest occupied floor will be 905 feet. That figure may not include the ‘fins’ atop Foster’s vision, given that Department of Buildings measurements do not include architectural flourishes; if 425 Park Avenue doesn’t break the 1,000-foot mark, it will certainly come close. While the future of the Midtown East re-zoning has been temporarily derailed, the cloud of disconcertion should be temporary, as De Blasio has promised to continue the push that failed under the Bloomberg administration. 425 Park Avenue is not dependent on the re-zoning, as it will simply be a re-configuration of the existing square footage into Class A space. Indeed, moving forward ahead of the general re-zoning will give L&L an edge over other developers, as 425 Park Avenue will rise several years prior to competing projects. The lower quarter of the existing 425 Park Avenue must be preserved, so demolition may be more difficult than usual, but L&L’s project is expected to be completed in 2017.
first time seeing that render. It looks to be ~ 900’ with fins. 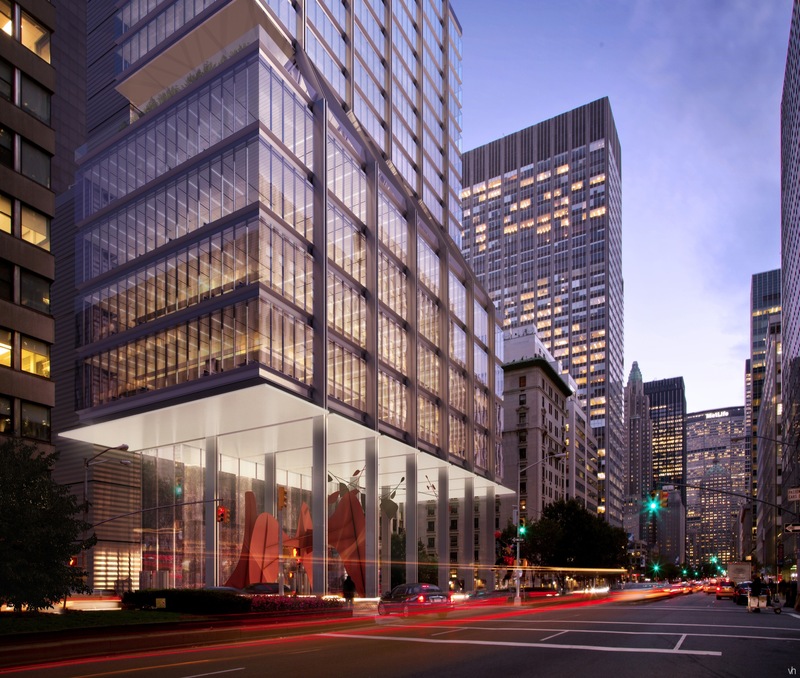 This will be an iconic addition to Park Avenue like the 375 Park Ave (Seagram). Really looking forward to see this start. cheers! Full screen and in HD is a must! The song that they picked to complement the video is some inception right there. Feels like a movie. Also, pause at 2:05, and 2:16; you’ll thank me. The context of the development has shifted dramatically with the recent rise of 432 Park Avenue, positioning a 1,397-foot goliath diagonally across the street from Foster’s building. But 425 Park Avenue will be prominent in its own right, and per zoning diagrams filed with the Department of Buildings, the skyscraper will stand 860 feet to the top of its fins. Much like Hearst Tower, 425 Park Avenue will also employ Foster’s trademark diagrid pattern, though in this instance it will only cover a portion of the project’s Park Avenue frontage. 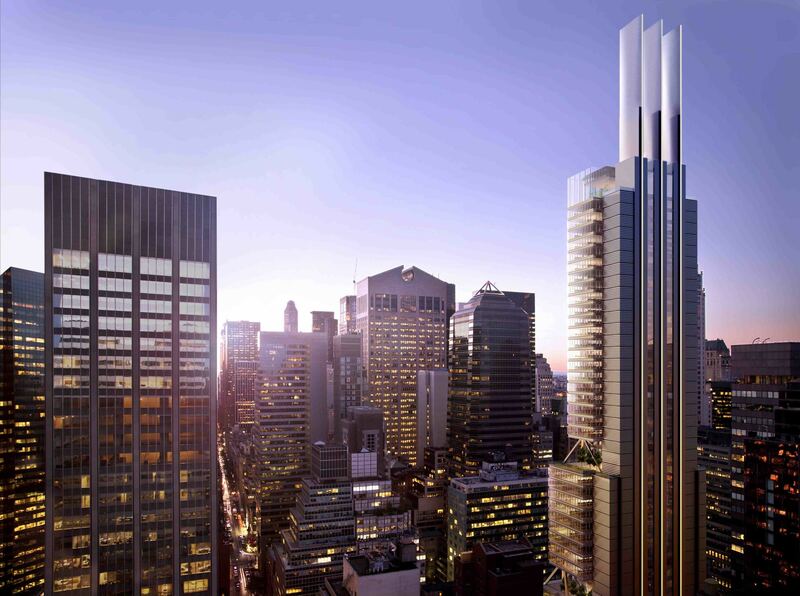 The rest will be dominated by vertical metallic bands, which ultimately yield to the trident-like crown, which will still rank among the tallest buildings in New York City, falling roughly halfway between the MetLife Building at 806 feet, and the nearby Citigroup Center, which is 915 feet tall. The 625,000 square-foot tower will only rise 42 stories, providing for generous ceiling heights of either 9.5 or 14.5 feet, while a “club floor” with floor-to-ceiling glass will have ceilings measuring 41 feet. I agree, Atl. This tower is great! Just curious… How high can scaffolding go? Thanks for the pics rw! I don’t know about the scaffolding. What’s that vacant lot in the foreground of the second image? That’s part of the site for the proposed Marmara Hotel on Lex. Couldn’t find any rendering or whatever on that development. I’m guessing it’s early in its design phase. There are nice old townhouses on the adjacent side street.